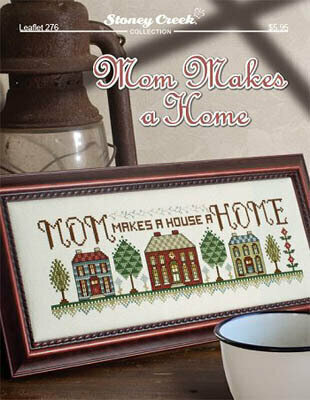 "Mom makes a house a home." Stitch Count: 167W x 50H. Model stitched on 28 ct Antique White Jobelan using DMC & DMC Color Variations floss. 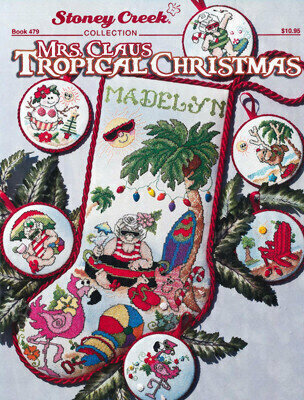 Model for Mrs. Claus Tropical Stocking was stitched on 28 Ct. Clear sky by Stoney Creek using DMC floss, DMC color variations and Stoney Creek Buttons x(optional) Stitch count 137x225. 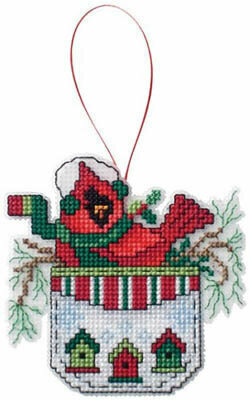 (floss listing is for stocking only) Leaflet includes Christmas ornaments stitch count 43x44. Model stitched on 28 Ct. Antique white using DMC , DMC pearl Cotton #8, DMC color variations, Glissen Gloss and magnets from Stoney Creek (MG033). Three barn patterns in this leaflet. 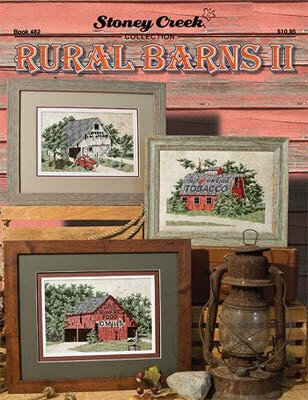 Old Virginia Tobacco Barn was stitched on 28 Ct. Legacy linen using DMC & Weeks Dye Works floss. Stitch count 160x108. 10 Miles Barn was stitched on 28 Ct. Sand Cashel linen using DMC & Weeks Dye Works floss. 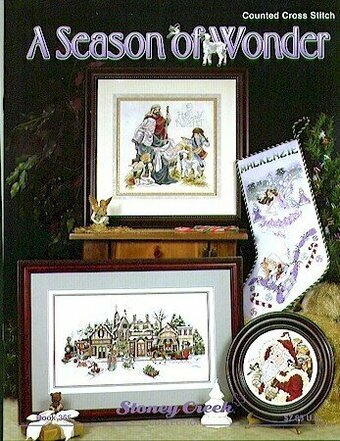 Stitch count 155x104. Caverns Barn is stitched on 28 Ct. Legacy using DMC, Weeks Dye Works and Glissen gloss floss. Stitch count 155x91. 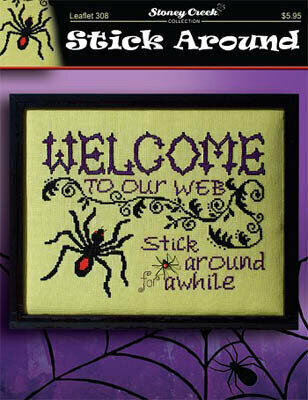 "Welcome to our web. 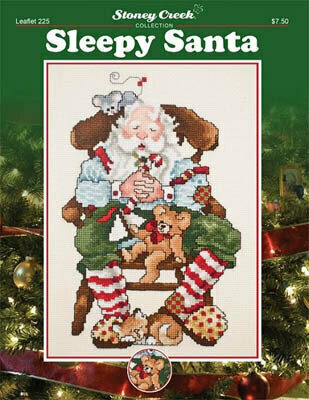 Stitch around awhile." Model is stitched on 28 Ct. Tropical green linen using DMC floss, Weeks Dye Works and buttons by Stoney Creek. "Hybrid Human runs on Coffee" stitched on 28 Ct. Antique white Jobelan. Stitch count 51x65. "Life..it's all about how you handle Plan B" stitched on 28 Ct. Antique white Jobelan. 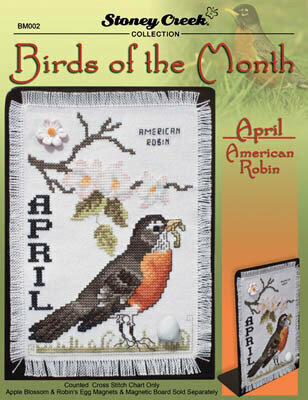 Stitch count 60x59. "Organization takes the fun out of everything" stitched on 28 Ct. Lambswool linen. 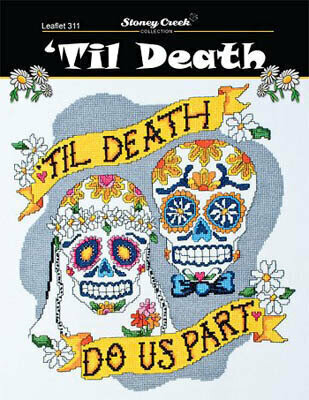 Stitch count 129x47. "Follow your heart but take your brain with you!" Stitched on 28 Ct. Antique white Jobelan. Stitch count 96x108. "Lead me not into temptation I have my own GPS." Stitched on 28 Ct. Antique white Jobelan. Stitch count 93x41. "I've learned so much from my mistakes, I think Owl make a few more." Stitched on 28 Ct. Lambswool linen. 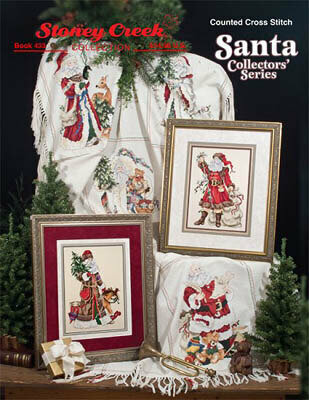 Stitch count 60x109. stitched on 28 Ct. Antique white Jobelan. Stitch count 93x41. "Deja Moo: the feeling you've heard this bull before." Stitched on 28 Ct. Antique White Jobelan. Stitch count 135x49. Model stitched on 28 Ct. White Lugana over two threads using DMC floss. Stitch count 149x161. 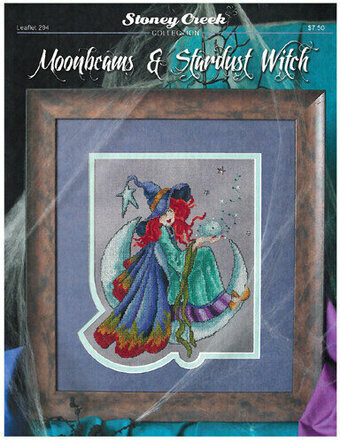 All models stitched over 2 threads on 28 Ct. Stormy Grey Jobelan with DMC floss, Rainbow Blending thread, and Mill Hill beads. 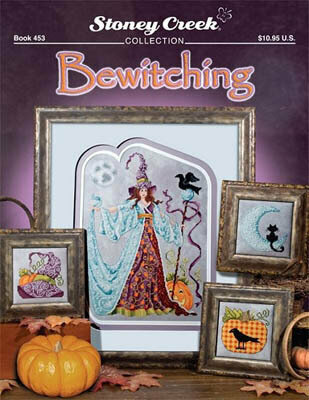 "Bewitching" stitch count: 146W x 204H. "Cat in the Moon" stitch count: 55W x 55H. "Good Witch Hat" stitch count: 55W x 55H. "Crow and the Pumpkin" stitch count: 55W x 55H. 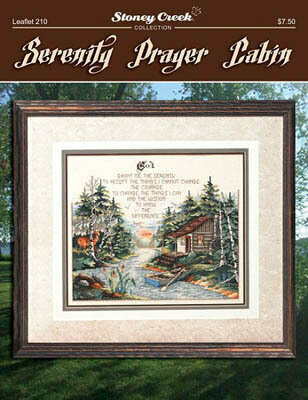 Model stitched on 28 ct white Jobelan using Anchor or DMC floss, DMC #8 and Stoney Creek MG018. 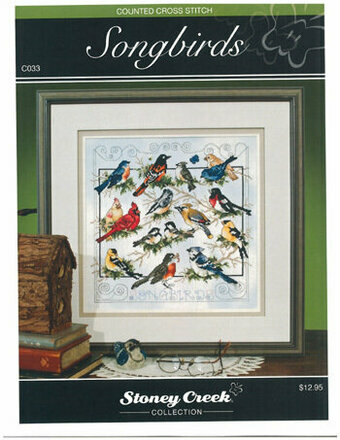 Stitch count 66x89. Model stitched on 28 Ct. White Jobelan with DMC or Anchor, and Weeks Dye Works floss. 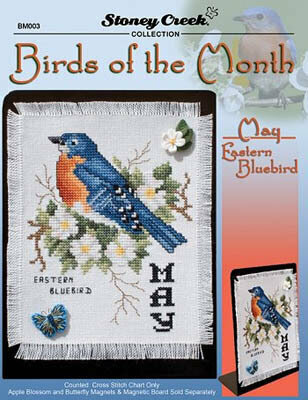 Shown with Apple Blossom & Robin's Egg Magnets from Stoney Creek. Stitch Count: 63W x 91H. Model stitched on 28 Ct. White Jobelan with DMC or Anchor Floss, #8 Pearl Cotton, and Weeks Dye Works floss. Stitch Count: 67W x 91H. 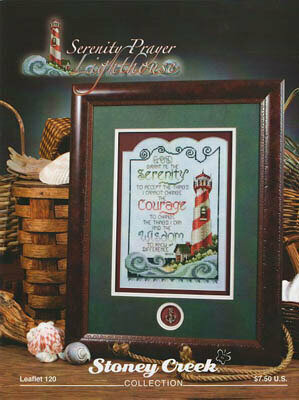 Shown with Stoney Creek Magnets (MG024 Autumn Leaves). 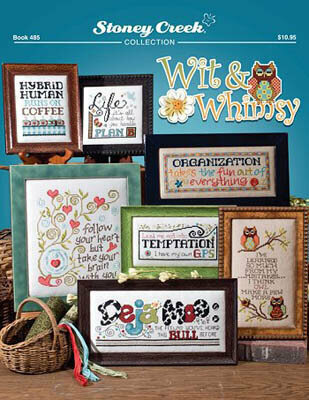 Take a walk on the wild side with these new designs. 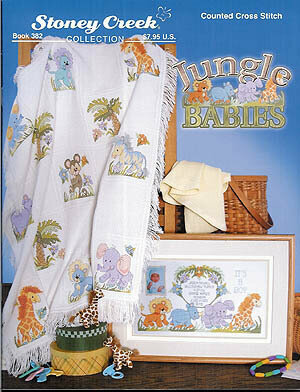 Includes "Twins(Fawns)"stitch count 171x152, "Wolf Pups" stitch count 160 x 157, "Mother & Child- Giraffes"stitch count 139x147, "Cheetah" stitch count 87x93, "Lion Cub"stitch count 76x104, and "Tiger Cub." stitch count 83x93. 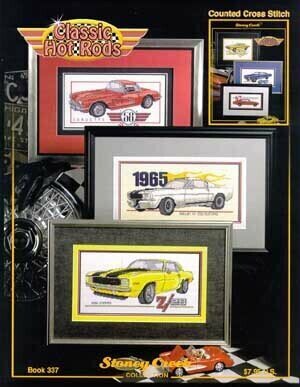 A collection of classic hot rods for the car enthusiast - 1958 Corvette stitch count 155x80, 1965 Shelby Mustang stitch count 164x68 , 1969 Camaro Z28 stitch count 162x78, 1970 Challenger stitch count 145x98, 1967 Pontiac GTO stitch count 159x70, and 1967 Dodger Charger stitch count 141x57. 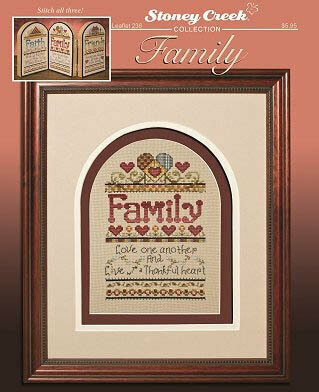 "Family - Love One Another and live with a thankful heart." Model stitched on 28 ct. Lambswool Jobelan with DMC or Anchor floss. Stitch Count: 64W x 98H. Model stitched on 28 Ct. Antique White Jobelan with DMC or Anchor floss, Weeks Dye Works (or DMC 420), and Rainbow Blending Thread. Shown with charms from By Jupiter (J13275AS, J80155AS). Stitch Count: 135W x 83H. 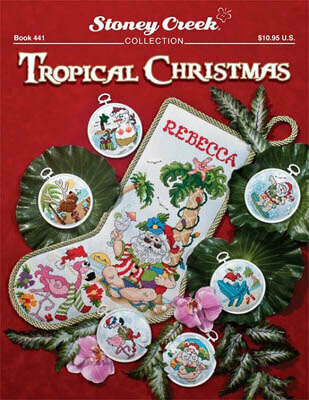 This delightful baby cross stitch book contains thirteen whimsical designs of baby jungle animals and palm trees that can be stitched individually or as part of an afghan (designed for a 14 ct Nursery Time afghan - item #123-4367). 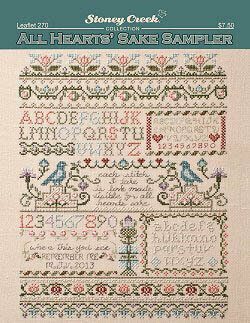 A coordinating birth sampler can be stitched with baby's personalization and a photograph, if desired. 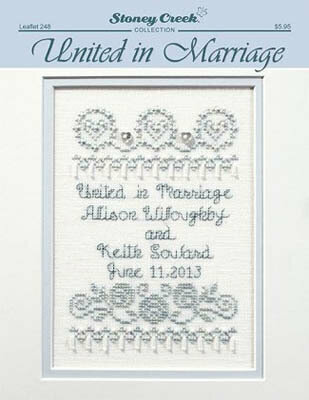 Baby announcement model stitched on 28 count White Monaco over 2 threads with DMC floss. Stitch count 217W x 116H. 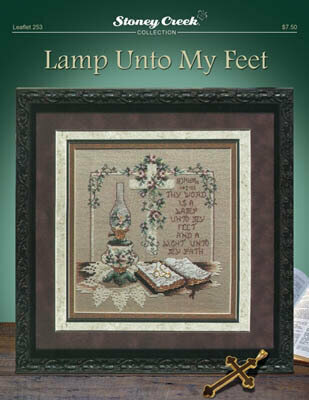 "Psalm 119:105 Thy Word is a lamp unto my feet and a light unto my path." Model stitched on 28 Ct. Light Taupe Lugana with DMC or Anchor floss, Glissen Gloss Rainbow Blending Thread, and Kreinik #7 Japan thread. Stitch Count: 105W x 118H. "A special day, a special love." Model stitched on 14 Ct. White Opalescent Aida with DMC or Anchor floss, DMC color Variations, Glissen Gloss Rainbow Blending thread, and Mill Hill beads. Stitch Count: 125W x 101H. "O Christmas tree, O Christmas tree! Thou tree most fair and lovely! The sight of thee at Christmastide spreads hope and gladness far and wide. O Christmas tree, O Christmas tree thou most fair and lovely." Model stitched on 28 Ct. hand-dyed aged ecru fabric by Stoney Creek with DMC floss, #8 Pearl Cotton, Gentle Art Sampler threads, Glissen Gloss Rainbow Blending thread, and Mill Hil beads. 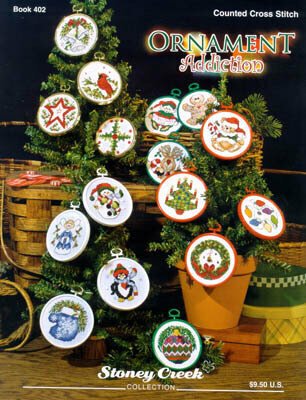 Also required but not shown in the list above - 3 Mini Star charms from Birdhouse Enterprises (BE010)and 2 small wreath buttons from Stoney Creek (SB371S). Stitch Count: 101W x 246H. "God grant me the serenity to accept the things I cannot change, the courage to change the things I can, and the wisdow to know the difference." Model stitched on 28 Ct. Potato Lugana with DMC floss, DMC Light Effects, Glissen Gloss Rainbow Blending threadd and Rainbow Gallery Tweed (#RT11 Tan **not listed with supplies above). Stitch Count: 174W x 147H. "God grant me the serenity to accept the things I cannot change, the courage to change the things that I can, and the wisdom to know the difference." 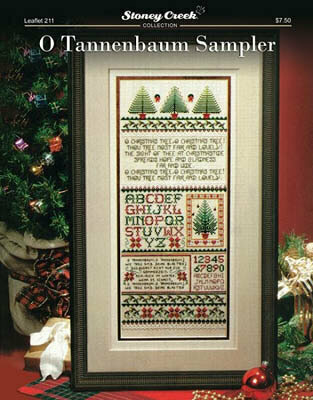 Model stitched on 28 Ct. Summer Clouds fabric by Stoney Creek with Anchor or DMC floss,and Gentle Art Sampler threads. Stitch Count: 100W x 145H. Model stitched on 28 Ct. White Jobelan with DMC floss, Glissen Gloss Rainbow Blending Thread, and Kreinik Japan thread. 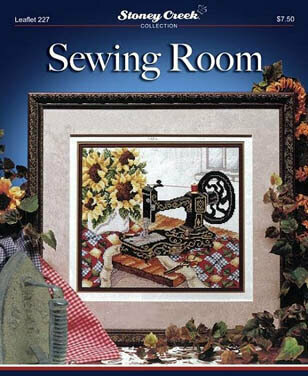 Stitch Count: 155W x 140H. Also required, but not included in the list above, Birdhouse Enterprises Charms (BE004 and BE011) and Angle's Whisper buttons (AW1161-W). 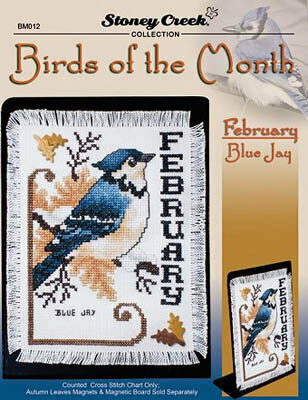 "February - Hugs and kisses warm the heart in Mid-Winter's cold and dark." Model stitched on 28 Ct. clear Sky Stoney Creek dyed fabric with Anchor or DMC floss, DMC Pearl Cotton, SJ Designs beads (3mm gold), and Stoney Creek Magnets (MG012 - 2). Stitch Count: 98W x 71h. 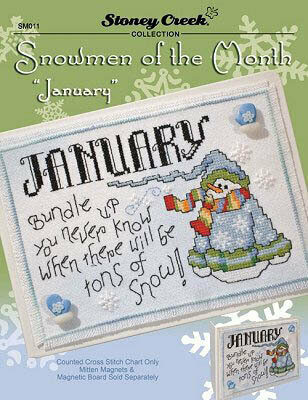 "January - Bundle up. You never know when there will be tons of snow! "Model stitched on 28 Ct. clear sky by Stoney Creek with Anchor or DMC floss, DMC #8 pearl cotton, and DMC Color Variations. 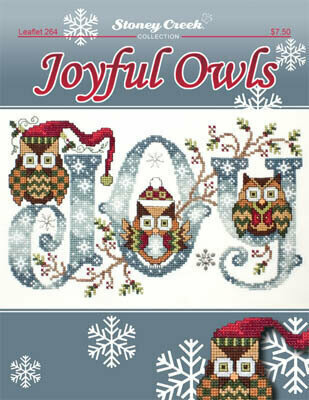 Shown with magnets by Stoney Creek (MG011 - mittens). Stitch Count: 99Wx71H. 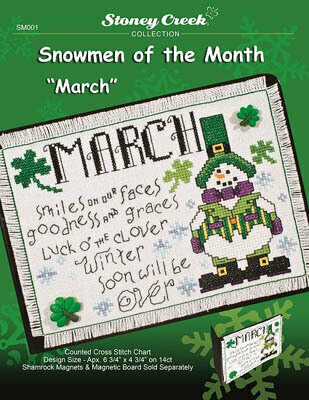 "March - Smiles on our faces, goodness and graces. Luck O' the clover Winter will soon be over." 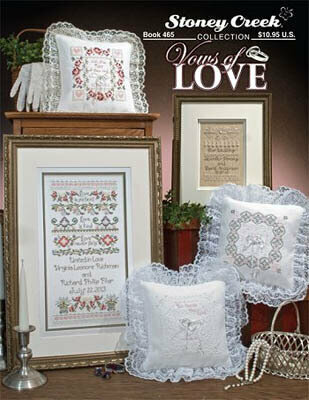 Model stitched on 28 Ct. White Jazlyn with DMC floss, DMC Color Variations, and shown with Stoney Creek Shamrock Magnets (MG001 - set of 2). Stitch Count: 91W x 63H. 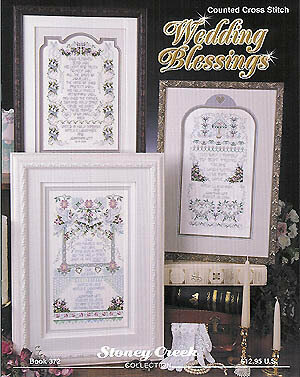 "November - Harvest blessings, thankful hearts, gather together as feasting starts." Model stitched on 28 Ct. Ivory Jobelan with Anchor or DMC floss. Shown with Stony Creek Magnets (MG009 - heart & flower pot). Stitch Count: 95W x 67H. "October. October's song sweet harmony colors the earth so beautifully". Model stitched on 28 Ct. Lambswool Jobelan with DMC or Anchor floss. Stitch Count: 95W x 67H. Shown with magnets from Stoney Creek (MG008 Pumpkin and Leaf). 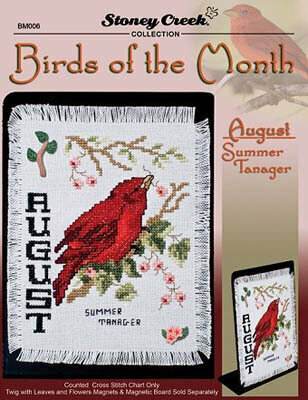 "September - New beginnings, fresh starts rule. 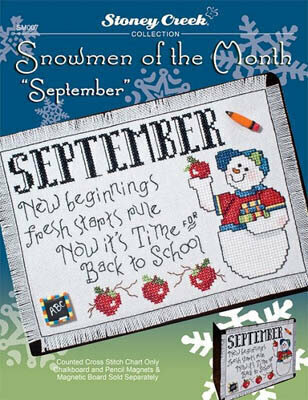 Now's it's time for back to school!" Model stitched on 28 Ct. White jobelan with DMC or Anchor floss. Stitch Count: 95W x 67H. 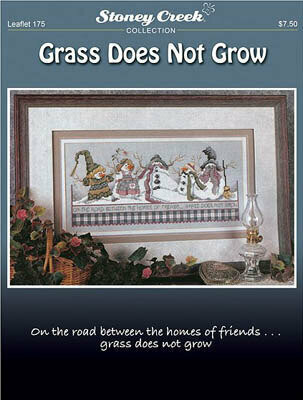 Shown with a September Snowman (set of 2) magnet by Stoney Creek (not included in list above). 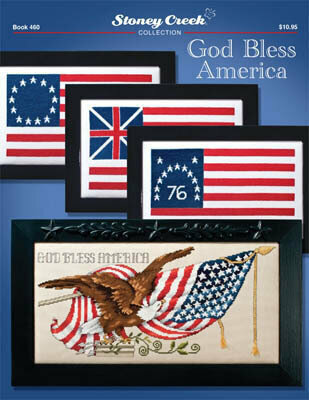 Model was stitched on 28 ct clear sky Stoney Creek Dyed fabric using either Anchor or DMC floss, Gentle Art Sampler Threads and Glissen gloss colorwash floss (forest fire). Stoney Creek buttons sold separately. 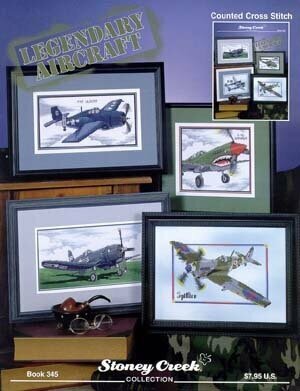 Stitch count 169x160. 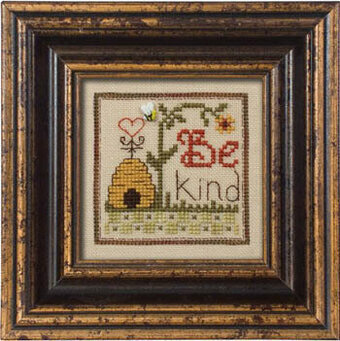 Model stitched on 28 Ct. white Cashel linen with DMC or Anchor floss, Mill Hill beads and Mill Hill treasures. 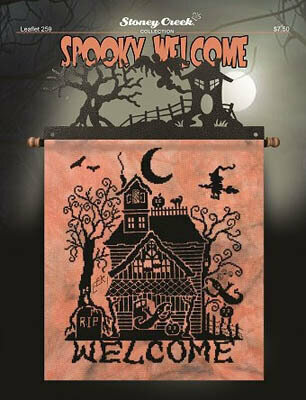 Stitch Count: 63W x 90H. 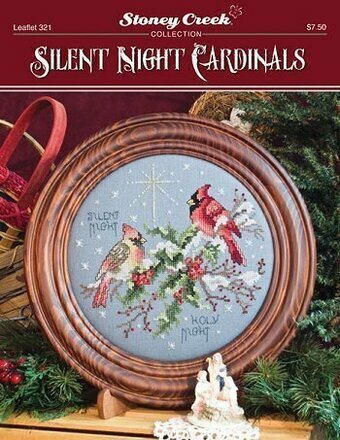 "The Carolers" was stitched on 28 Ct. Clear Sky Stoney Creek hand-dyed fabric with DMC or Anchor foss, DMC Color Variations, Glissen Gloss Rainbow Blending Thread, Mill Hill beads, and Stoney Creek buttons. Stitch Count: 154W x 188H. 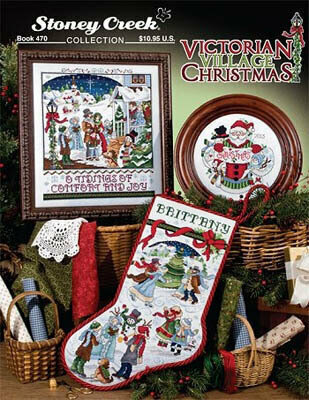 "Skater's Waltz Christmas Stocking" was stitched on 28 Ct. Clear Sky Stoney Creek hand-dyed fabric with DMC or Anchor floss, DMC Color Variations, Glissen Gloss Rainbow Blending thread, Mill Hill beads, and Stoney Creek buttons. 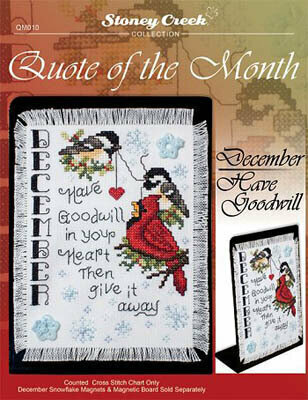 Stitch Count: 148W x 245H. 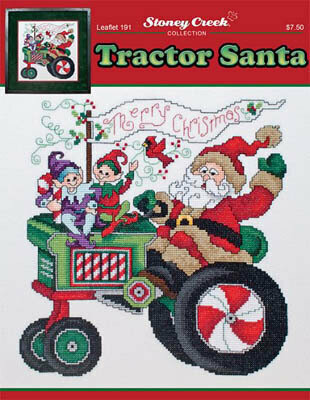 "Santa Plate 2013" stitched on 28 Ct. Clear Sky Stoney Creek hand-dyed fabric with Anchor or DMC floss, DMC Color Variations, and Glissen Gloss Rainbow Blending Thread. Stitch Count: 99W x 99H.